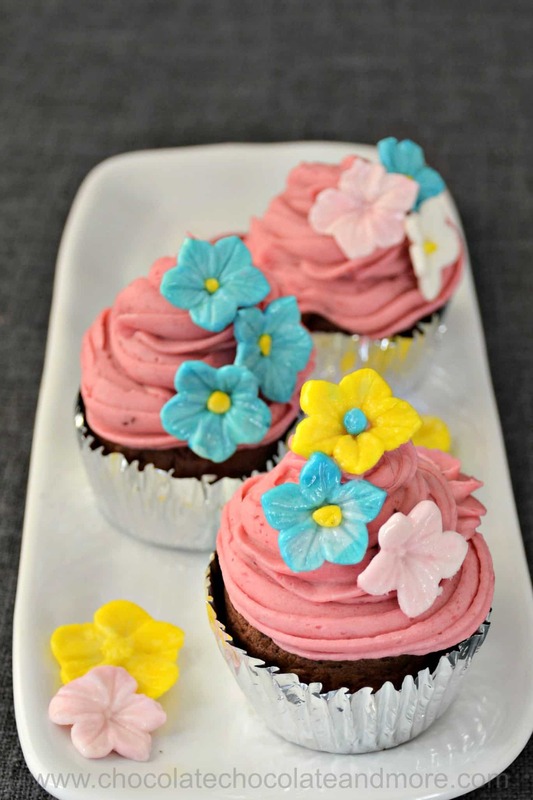 Purple Velvet Cupcakes - Chocolate Chocolate and More! Purple Velvet Cupcakes combine chocolate with blackberries. Frost with Blackberry buttercream for an amazing summer treat. I had a wonderful Fourth of July. We didn’t have fireworks or barbecue like back home but I had friends over and that’s really what holidays are about. 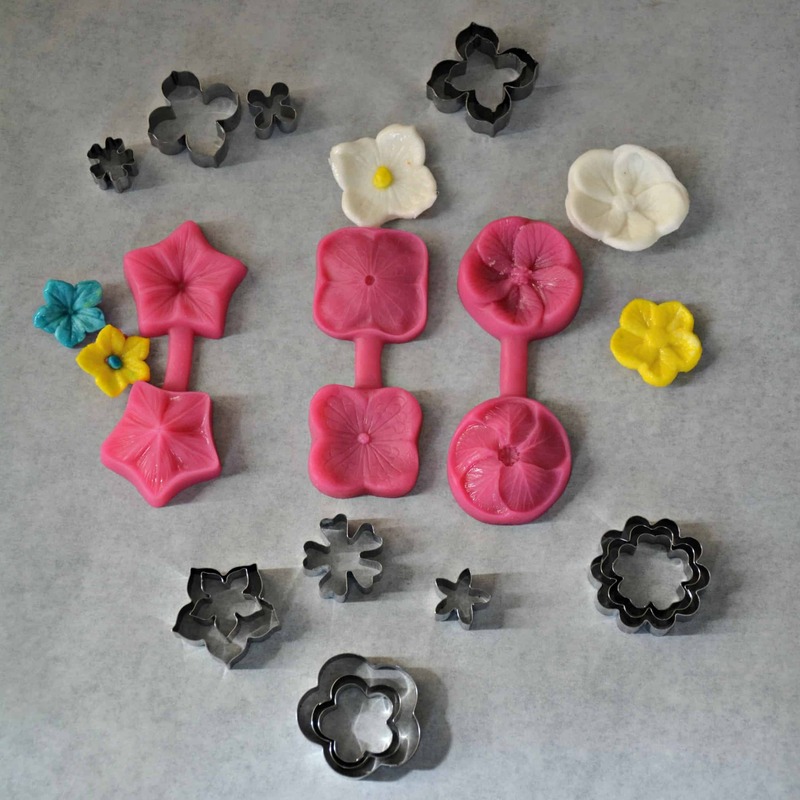 Before Easter Blossom Sugar Art sent me a set of molds to try out. She sent them to me in Cambodia (amazing) and she included a personalized note. Now that’s customer service. She actually sent me three sets. From left to right they are the Petunia Cutter & Mold Set, the hydrangea mold and cutter set, and the Snow Rose Set – Silicone mold & cutter . I’ve been wanting to try these for a long time. They looked simple enough for a child so I wanted to test just how easy they are to use. The problem is my kids are grown. I had some company over on Independence day and one of my guests was four-year-old Sophia. My coffee table was the perfect height for Sophia. She rolled out the fondant, cut it with the cutters, and pressed it in the molds. She had a little trouble positioning the fondant in the molds. But after the first two flowers, she made them like a pro! 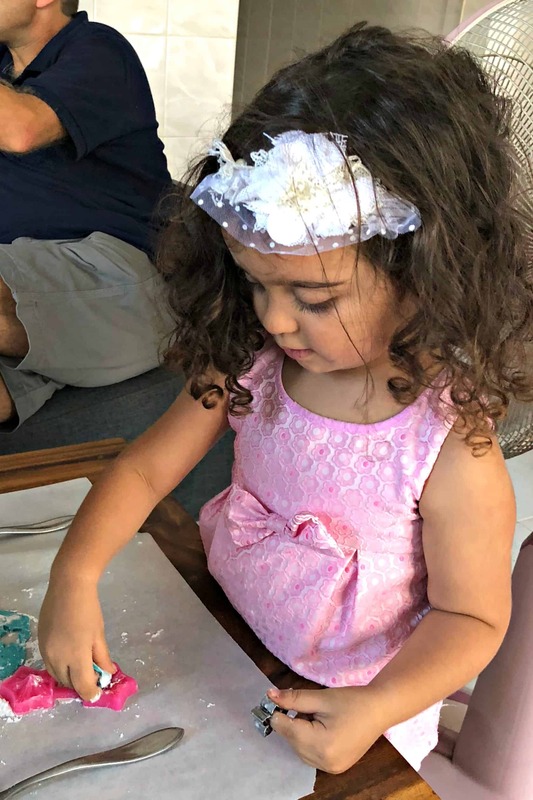 I thought the petunia mold would be the hardest but Sophia found it the easiest. She also made some snow roses but wasn’t too interested in the hydrangea. It was such fun to make these with a child. 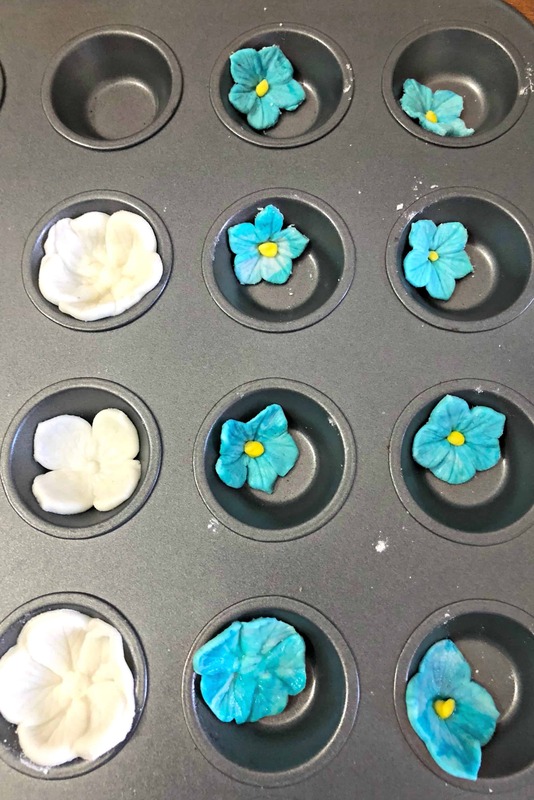 I set the flowers in a mini muffin pan to dry so they’d retain their curved shapes. I also found that the smaller cutters worked better for me than the full size ones. The key is not to press too hard. Blossom sugar art makes it really easy to get professional results. They also carry butterfly molds! I’ll be ordering some of those when I get home. Now about these purple velvet cupcakes. I found the recipe on BBC food but reviews indicated that you couldn’t taste the blackberries. So I boiled mine down to make a concentrate. The blackberry flavor is still mild but you don’t get the seeds if you put the concentrate through a sieve. I also couldn’t find purple food coloring so my cupcakes aren’t very purple. They do have better blackberry flavor than the original recipe though. Adding blackberry puree to buttercream gives really amazing flavor. Smash blackberries in a small saucepan. Cook over medium high heat until the liquid reduces to half. Put through a sieve to separate out the seeds from the concentrate. You should have about 2 cups puree. Use half for the cupcakes and the other half for the frosting. Line a muffin pan with paper liners. Preheat oven to 350°F. Melt butter and chocolate together. Stir in 1 cup of the blackberry concentrate. Stir in flour, baking powder, salt, cocoa powder and sugar. Mix in eggs and then mix in the boiling water. Do not over mix. If desired add purple food coloring to get purple color. Spoon into cupcake liners. 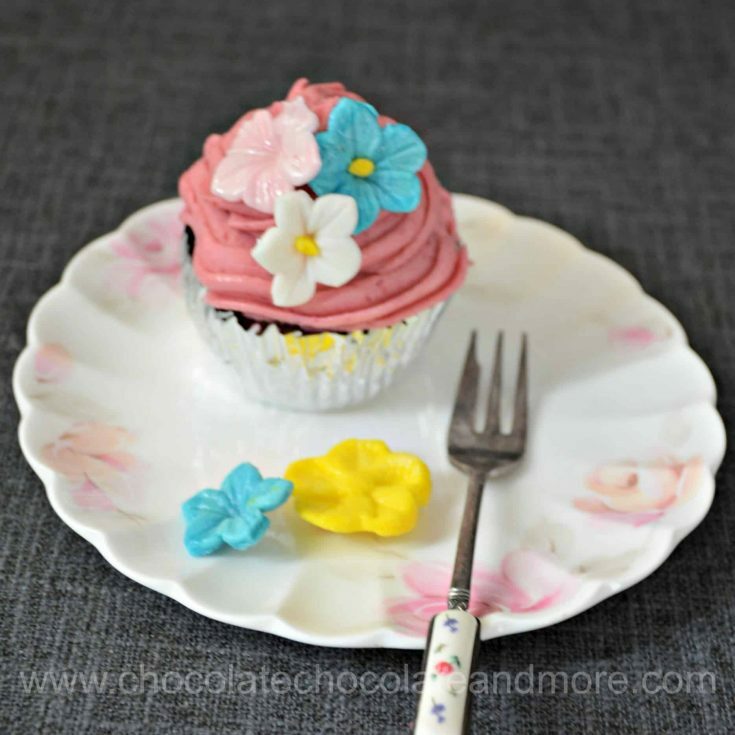 Bake for 15 minutes or until a toothpick inserted in center cupcake comes out clean. Cream butter and sugar together. Beat in last cup of blackberry concentrate. If needed, add more powdered sugar to make the frosting more stiff.